Here we’ll run through some of the common questions about the Passive House Standard. Is it Passive House or Passivhaus? Both. The Passivhaus standard originates from Germany, where the first Passivhaus was built in 1991. Since then the standard has spread around the world. Passive House is simply the English equivalent. Does Passive House only apply to homes or houses? No. This is a common misconception that is unfortunately caused by including ‘house’ in the name of the standard. The Passive House standard would be a more complete term. Passive House can be applied to any building. What is passive about a Passive House? Passive Houses are passive as they require very little active heating or cooling to remain at a comfortable temperature. This goal is achieved with little energy input and hence the term passive is used. Airtightness, insulation and good design make this possible. Yes! However, it is less likely that you will need to. 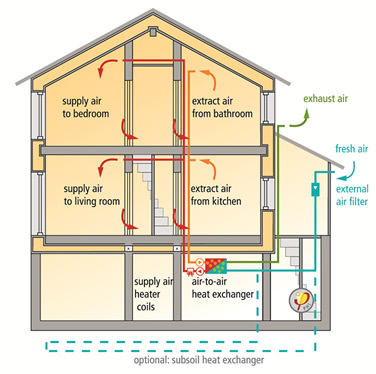 The internal temperature and a steady supply of fresh air is provided by ventilation, so the air in a Passive House is less likely to get stale and require open windows. In addition, bad smells and unwanted moisture will be extracted. What’s special about a Passive House certified window? Just as windows allow light into a room, they also allow the Sun’s energy to warm the building. Passive House windows are triple glazed with well insulated frames. With good design, accounting for the ‘pathway’ of the Sun throughout the year and the reducing or inducing of shading on the windows, Passive House windows can effectively act as the radiators of the building. During Winter, more energy will be allowed in to the building than out. Conversely in Summer when the Sun is higher in the sky and the additional energy is not desired, the solar gains are reduced. Is a Passive House comfortable in hot weather? Yes. The insulation in a Passive House doesn’t just keep the property warm in Winter, it keeps the heat out in Summer. Induced shading on the windows (either from deep windows or external automated blinds) reduces the solar gains of the property significantly. With the additional use of ventilation, both temperature and humidity can be effectively controlled. Conventional buildings suffer from draughts caused by unwanted air infiltration through gaps and joints. This is unreliable, potentially uncomfortable and cannot guarantee a healthy indoor air quality. Hence the opening of windows in the Summer for fresh air in conventional builds. Ventilation ensures a comfortable supply of air as efficiently as possible. In addition, the extraction of air prevents the possibility of moisture damage and the build-up of mould spores. The aesthetics are largely up to the Client. As the Passive House standard relates solely to the building performance, not the aesthetics the exterior look of a Passive House can vary considerably. There will be some recurring features though such as larger windows oriented towards South than North (in our hemisphere anyway) and thicker walls. Internally, radiators will be absent as heating is achieved through solar gains and ventilation with heat recovery.